“The newly discovered supersized black hole resides in the center of a massive elliptical galaxy, NGC 1600, located in a cosmic backwater, a small grouping of 20 or so galaxies,” said lead discoverer Chung-Pei Ma, a University of California-Berkeley astronomer and head of the MASSIVE Survey, a study of the most massive galaxies and supermassive black holes in the local universe. 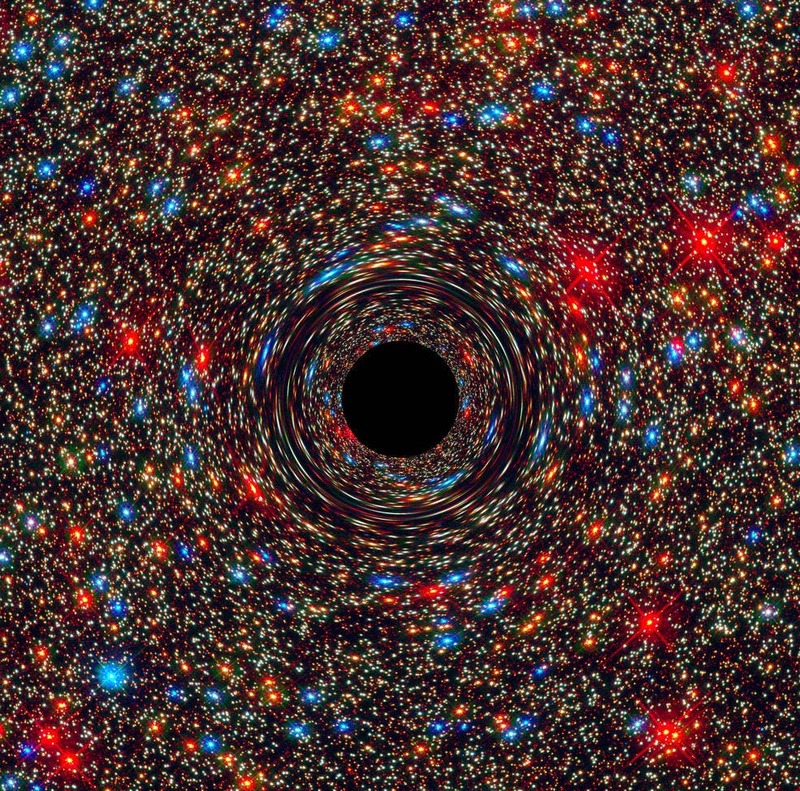 While finding a gigantic black hole in a massive galaxy in a crowded area of the universe is to be expected – like running across a skyscraper in Manhattan – it seemed less likely they could be found in the universe’s small towns. The researchers also were surprised to discover that the black hole is 10 times more massive than they had predicted for a galaxy of this mass. Based on previous Hubble surveys of black holes, astronomers had developed a correlation between a black hole’s mass and the mass of its host galaxy’s central bulge of stars – the larger the galaxy bulge, the proportionally more massive the black hole. But for galaxy NGC 1600, the giant black hole’s mass far overshadows the mass of its relatively sparse bulge. “It appears that that relation does not work very well with extremely massive black holes; they are a larger fraction of the host galaxy’s mass,” Ma said. Ma and her colleagues are reporting the discovery of the black hole, which is located about 200 million light years from Earth in the direction of the constellation Eridanus, in the April 6 issue of the journal Nature. Jens Thomas of the Max Planck-Institute for Extraterrestrial Physics, Garching, Germany is the paper’s lead author. One idea to explain the black hole’s monster size is that it merged with another black hole long ago when galaxy interactions were more frequent. When two galaxies merge, their central black holes settle into the core of the new galaxy and orbit each other. Stars falling near the binary black hole, depending on their speed and trajectory, can actually rob momentum from the whirling pair and pick up enough velocity to escape from the galaxy’s core. This gravitational interaction causes the black holes to slowly move closer together, eventually merging to form an even larger black hole. The supermassive black hole then continues to grow by gobbling up gas funneled to the core by galaxy collisions. “To become this massive, the black hole would have had a very voracious phase during which it devoured lots of gas,” Ma said. The frequent meals consumed by NGC 1600 may also be the reason why the galaxy resides in a small town, with few galactic neighbors. NGC 1600 is the most dominant galaxy in its galactic group, at least three times brighter than its neighbors. “Other groups like this rarely have such a large luminosity gap between the brightest and the second brightest galaxies,” Ma said. The velocity measurements were made by the Gemini Multi-Object Spectrograph (GMOS) on the Gemini North 8-meter telescope on Mauna Kea in Hawaii. GMOS spectroscopically dissected the light from the galaxy’s center, revealing stars within 3,000 light-years of the core. Some of these stars are circling around the black hole and avoiding close encounters. However, stars moving on a straighter path away from the core suggest that they had ventured closer to the center and had been slung away, most likely by the twin black holes. Archival Hubble images, taken by the Near Infrared Camera and Multi-Object Spectrometer (NICMOS), supports the idea of twin black holes pushing stars away. The NICMOS images revealed that the galaxy’s core was unusually faint, indicating a lack of stars close to the galactic center. A star-depleted core distinguishes massive galaxies from standard elliptical galaxies, which are much brighter in their centers. Ma and her colleagues estimated that the amount of stars tossed out of the central region equals 40 billion suns, comparable to ejecting the entire disk of our Milky Way galaxy. News and original insights on science, space exploration, cosmology, astrobiology, and astrophysics.